As regular salon visitors will know, I share my tottering abode with a colonial gentleman and on occasion, his limited influence results in a story with an American flavour. Today is one of those days as I combine my gent's county of origin with one of my passions, music, to tell the tale of an important moment in publishing. In 1814, amateur poet, Francis Scott Key, found himself so moved by events he had witnessed at the Battle of Fort McHenry two years earlier that he set pen to paper and poured out his feelings in the poem, Defence of Fort M'Henry. I have never been a poet and hold a certain regard for those who work in the medium, so I am hardly surprised that Key was pleased enough with his composition to pass it on to his brother-in-law, Judge Joseph H Nicholson. Now, I have dear brothers-in-law of my own but I doubt that any of them would have made the connection that Nicholson did when he read the four stanza poem by Key. He noticed that the words fit perfectly to the tune of The Anacreontic Song, a work written by John Stafford Smith in the 1760s, a melody that had already known various lyrics and versions. 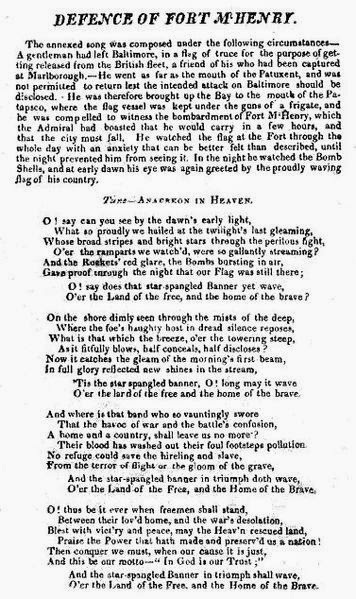 So imposed was he by Key's work that Nicholson had anonymous broadsides of the poem printed and distributed in Baltimore on 17th September 1814. However, it was three days later on 20th September that The Baltimore Patriot and The American printed the verses once more, noting that they should be sung to the tune of The Anacreontic Song. The poem became wildly popular and within days Thomas Carr in Baltimore published the words and music together under a title that would become legendary and, form humble beginnings, The Star Spangled Banner was born.